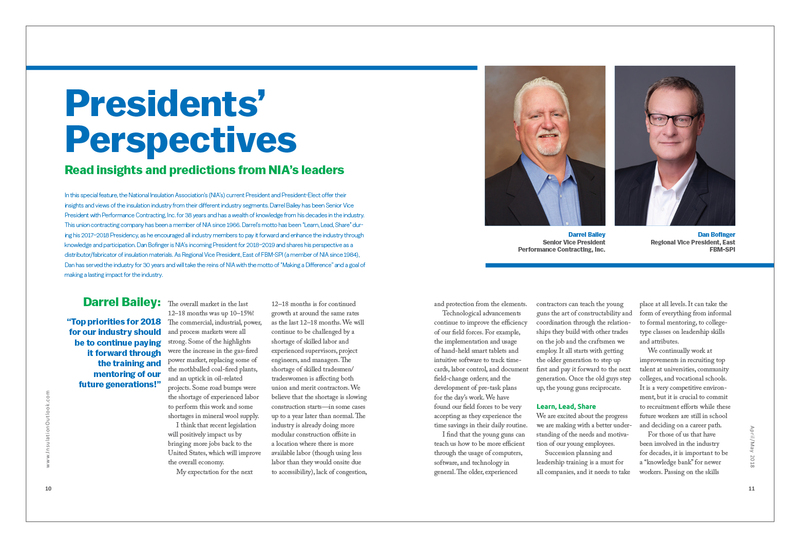 Read insights and predictions from NIA’s leaders. In this special feature, the National Insulation Association’s (NIA’s) current President and President-Elect offer their insights and views of the insulation industry from their different industry segments. Darrel Bailey has been Senior Vice President with Performance Contracting, Inc. for 38 years and has a wealth of knowledge from his decades in the industry. This union contracting company has been a member of NIA since 1966. Darrel’s motto has been “Learn, Lead, Share” during his 2017–2018 Presidency, as he encouraged all industry members to pay it forward and enhance the industry through knowledge and participation. Dan Bofinger is NIA’s incoming President for 2018–2019 and shares his perspective as a distributor/fabricator of insulation materials. As Regional Vice President, East of FBM-SPI (a member of NIA since 1984), Dan has served the industry for 30 years and will take the reins of NIA with the motto of “Making a Difference” and a goal of making a lasting impact for the industry. The overall market in the last 12–18 months was up 10–15%! The commercial, industrial, power, and process markets were all strong. Some of the highlights were the increase in the gas-fired power market, replacing some of the mothballed coal-fired plants, and an uptick in oil-related projects. Some road bumps were the shortage of experienced labor to perform this work and some shortages in mineral wool supply. I think that recent legislation will positively impact us by bringing more jobs back to the United States, which will improve the overall economy. My expectation for the next 12–18 months is for continued growth at around the same rates as the last 12–18 months. We will continue to be challenged by a shortage of skilled labor and experienced supervisors, project engineers, and managers. The shortage of skilled tradesmen/tradeswomen is affecting both union and merit contractors. We believe that the shortage is slowing construction starts—in some cases up to a year later than normal. The industry is already doing more modular construction offsite in a location where there is more available labor (though using less labor than they would onsite due to accessibility), lack of congestion, and protection from the elements. Technological advancements continue to improve the efficiency of our field forces. For example, the implementation and usage of hand-held smart tablets and intuitive software to track timecards, labor control, and document field-change orders; and the development of pre-task plans for the day’s work. We have found our field forces to be very accepting as they experience the time savings in their daily routine. I find that the young guns can teach us how to be more efficient through the usage of computers, software, and technology in general. The older, experienced contractors can teach the young guns the art of constructability and coordination through the relationships they build with other trades on the job and the craftsmen we employ. It all starts with getting the older generation to step up first and pay it forward to the next generation. Once the old guys step up, the young guns reciprocate. We are excited about the progress we are making with a better understanding of the needs and motivation of our young employees. Succession planning and leadership training is a must for all companies, and it needs to take place at all levels. It can take the form of everything from informal to formal mentoring, to college-type classes on leadership skills and attributes. We continually work at improvements in recruiting top talent at universities, community colleges, and vocational schools. It is a very competitive environment, but it is crucial to commit to recruitment efforts while these future workers are still in school and deciding on a career path. For those of us that have been involved in the industry for decades, it is important to be a “knowledge bank” for newer workers. Passing on the skills and knowledge we have amassed during our years in the industry is a crucial part of developing the next generation of leaders. We can also use this experience to develop top-level training courses that meet the needs of those joining the workforce, help perpetuate best practices, and meet industry needs. When looking at the long-term success of an insulation system, there are several factors that must be taken into account. An insulation project’s success is based on having the proper, updated specification for the thermal, environmental, and abuse resistance of insulation and jacketing products. Design of piping and equipment must also take the clearances for the thickness of the entire installed insulation assembly into consideration. Additionally, the system’s long-term survival and efficiency—as well as the prevention of corrosion under insulation—is dependent on regular maintenance of the complete system. Properly designed, installed, and maintained insulation will provide significant energy and financial savings over the life of the system, as well as decreasing the chance of corrosion or other system issues. The last year and a half showed a continuing construction recovery. Commercial construction typically lags the residential construction by 12 to 18 months, so we saw growth during this recent 12–18-month period that we did not see previously due to the housing crisis. The industrial side took a different turn as the focus went away from oil and coal and turned toward natural gas. Power generation and building an infrastructure to export surplus natural-gas products provided good project work. As more money went into our economy and construction projects grew, the pace accelerated as well. Product availability was good, with a few exceptions, so we were able to service the growth demands. I believe the current construction cycle will remain strong in 2018 and into 2019. Despite the improvement in activity, I still see quite a bit of price pressure and demand for alternative ways to reduce cost. As a distributor, we are challenged by new regulations imposed on the trucking industry. The electronic logs that enforce the regulations require us to plan differently today versus a year ago. Once a project gets underway, the pace of construction and service demands appear to be accelerated. The business today requires you to react quickly and efficiently, but we certainly welcome the challenge of a growing economy. So far the current administration appears to have influenced the markets and spending related to construction and manufacturing. I can’t speak for the impact or influence on construction that the tax bill, tariffs, and immigration policies will bring, but we are pleased to see the positive economic trend in the last several months. Like most trends or change, technology has its positives and negatives. Technology has certainly made data analytics much easier and faster, but on the downside it creates a demand for immediate information and answers. The construction cycle seems to move faster and faster. The time from the engineering stage, to the bid stage, to construction seems to get more and more compressed. Many request for quote (RFQ) inquiries require a 24-hour, or often less, turnaround time. The time allotted for information, material delivery, or contract completion continues to get compressed. One change that could have a significant impact would be if the engineering and specifying communities improved the quality of mechanical insulation specifications. A well-written specification can accelerate the bid process and improve the overall construction process by leaving little for interpretation. A solid specification will also ensure the mechanical system will work properly and efficiently for many years. Mechanical insulation seems like such a small part of the overall cost of a building project, so sometimes it may be poorly specified or possibly be “de-value engineered” to a cheaper, lower-performing, product. Unfortunately, an improperly specified insulation system can lead to energy losses or system inefficiencies, causing larger problems. NIA is developing a certified Thermal Insulation Inspector Program that could help plant/facility managers and owners ensure that the insulation has been installed properly per the specification. This program is certainly something the engineers, specifiers, and building/plant managers and owners need to know about to help them plan for an improved future. We are currently in an “up” cycle in construction activity. I want to be sure we remain well positioned with people and resources to service the demands of this cycle. It remains a competitive environment, so we must be well equipped to execute efficiently and profitably. In regard to the changing labor pool, we have made adjustments by recognizing the expectations of people coming into the workforce today. Younger workers typically have a higher skill level and a shorter learning curve when it comes to technology. Overall, Millennials are a confident group that welcomes challenges. As a company, we have challenged some individuals by advancing them into management positions early in their working career; the results so far have been exceptionally positive. Overall, I find younger people today focused and hard working. They often accomplish things in non-traditional ways and they demand a good experience in the workplace. Not too long ago, the more senior workers were somewhat apprehensive of Millennials and their style of work. That uneasiness has dissipated and the interaction between the 2 groups is much more cohesive. This is certainly a welcome change that will benefit the industry as Baby Boomers continue to retire. Mechanical insulation is an old but proven technology. The industry has a lot to offer to anyone looking for a career that is self-sustaining and employs a group of the friendliest and most passionate professionals. My career in this industry has spanned over 30 years. It has kept my interest, provided for my family, and never required me to focus on a career change. I hope the actions we are taking at our company will help to impress these benefits on the new generation of workers, and help them make their own mark on the industry.